Ireland is home to a cluster of med tech companies that now employ 25,000 people nationwide. It's the highest ratio of people working in the industry in any country in Europe. The latest addition to the roster is Hollister, which committed another €80m at its facility in Ballina, Co Mayo this week. The specialist devices firm is one of the largest employers in the area and contributed more than €60m to the Irish economy last year. "The main reason we have done so well is that we have been building up a cluster over several years," said IDA Ireland chief Barry O'Leary. "If you get most of the world leaders, it tends to act as a magnet for more and more of them. "They look and see who is investing where in the med tech industry and if you look around Ireland it is one of the biggest in the world." 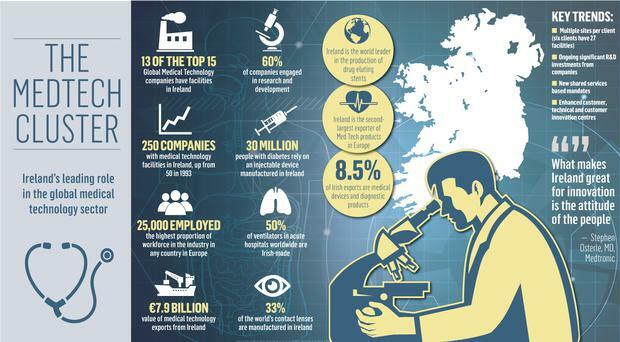 Our 250 med tech firms – up from 50 in 1993 – account for €7.9bn of Ireland's exports. Six out of 10 are also engaged in R&D here, as well as simply manufacturing and exporting. With a high concentration of companies located on the border, midlands and west counties, the sector brings much-needed high-quality employment to parts of the country that have suffered the worst in terms of investment and jobs growth. But when jobs are cut – like the 200 imminent redundancies expected at Bausch & Lomb in Waterford, on top of the threat of up to 1,200 jobs lost if the plant closes – the consequences are devastating and the ripple effect is felt across communities and local, national and international firms. While Ireland already manufactures pacemakers, defibrillators, a third of the world's contact lenses and half of the ventilators in acute hospitals worldwide, Mr O'Leary maintains there is room for expansion in the sector. "It is a sector of growth because there are still a lot of unmet medical needs," he continued, revealing there could be "three or four" major investments announced in the coming months. "There are illnesses that there are no devices for so all the time there are innovative products coming out and Ireland is well-placed to capitalise on that. "These firms make devices, but nowadays some are coated with pharmaceuticals so there is some convergence between devices and pharmaceuticals." A quarter of the firms – some of which are in competition – have also joined forces for support services like supply, finance, regulatory affairs, licensing, supply and technology support. Some 25pc have established shared services hubs. "That's another growing area," Mr O'Leary said. "Typically they'll have centre of excellences around the globe, with one in Europe, one in the US and one in Asia." Galway-based Boston Scientific, a manufacture of cardiology and peripheral vascular products, Johnson & Johnson and Medtronic are among the biggest names here, along with Covidien, which was criticised by some quarters in the US for moving its tax base to Ireland. Mr O'Leary maintains there can be no criticism of Covidien and disputes allegations Ireland offers deals. "Ireland does not do special deals," he insisted just days after Europe launched a probe into Apple's tax affairs here. "Covidien has 1,700 people in four different locations in Ireland so they have a substantial part of their activities in Ireland, and with huge substance you have a greater possibility of leveraging the 12.5pc corporation tax rate."